Not everyone is into the classic bridal look, and I think Vegas brides are a perfect example of this trend. If the idea of shopping bridal boutiques, getting fitted for a gown and dropping hundreds (if not thousands) of dollars on a dress then getting it to Las Vegas isn’t your deal, keep reading! 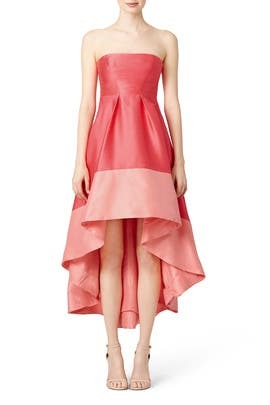 Rent the Runway is a great option for Vegas brides, bridesmaids and wedding guests. 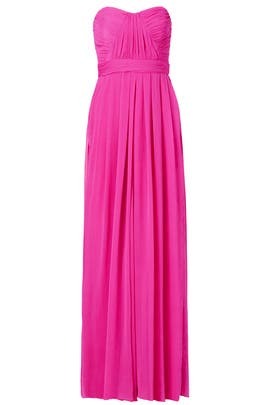 If you are not familiar with Rent the Runway, it is a designer gown rental service. 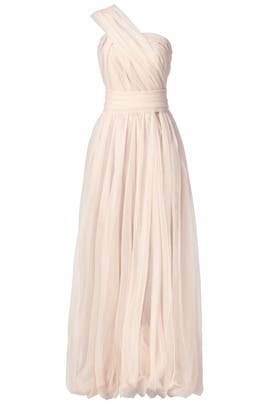 There are a number of popular “off the rack” looks in the shop at any given time, but the biggest bonus is being able to choose a gown online to pick it up in the shop when you arrive ahead of your wedding. 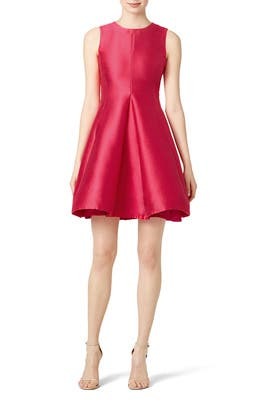 The online retailer/service now operates a boutique in Cosmopolitan in Las Vegas which makes picking up the designer dress of your dreams for a lower price point so much easier. I recently stopped in for a tour and some window shopping and was thrilled with what I found. Staffed by helpful staff (even on a busy afternoon) there were a number of Vegas locals and tourists picking up or trying on looks. The gown arrives freshly laundered and ready to wear. With sizing for nearly every body type, including tall and petite sizing, you will be surprised by how great these looks will fit. They even provide a back up size if you aren’t quite sure what the fit will be like. Rentals are typically for four days, making it easy to pick up and drop off without rushing back to return it the next day. Great for brides, mothers of the bride, bridesmaids, wedding guests, Vegas bachelorettes, honeymoon excursions, vow renewals, rehearsal dinners or bridal brunches, Rent the Runway is a stellar addition to the Vegas fashion scene. 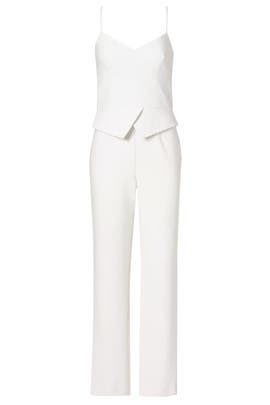 They will be sure to give your wedding aisle a big dose of couture style…at a fraction of the price. 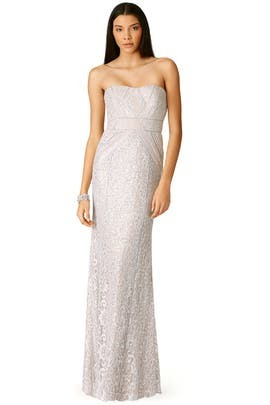 As a bonus, here are some of my favorite bridal and bridesmaid looks available through Rent the Runway. And for you Little Vegas Wedding readers, here’s a coupon for $25 off your first rental of $75 or more. Just use code 25OFFNEW at the checkout. 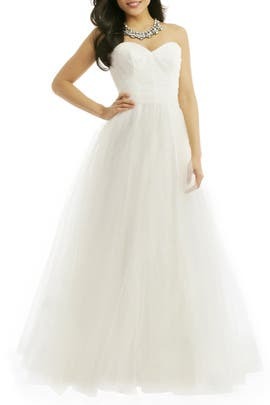 From luxe high-end to more affordable, chic looks, Rent the Runway has a crazy selection of traditional wedding gowns…and of course, more off beat if you have something else in mind. Jumpsuit, anyone? The best thing about bridesmaids looks is that there are multiple sizes, or even the same style in many colors, so it is easy, affordable and fun to outfit your maids. Book the trying-on suite at Rent the Runway at Cosmopolitan and turn it into a fun afternoon the day before the wedding. All the ladies need to bring is their shoes and dancing feet! 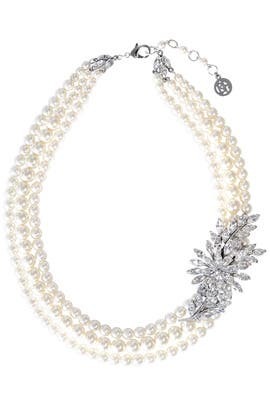 And if renting a dress just isn’t for you, jazz up your wedding day look with some snazzy luxe bridal accessories. Ben-Amun Wedding Bells Necklace – $65. RTR Bridal Accessories Walking on Clouds Veil – $150. RTR Bridal Accessories Dreamcatcher Veil – $40. 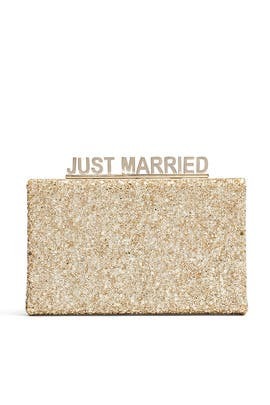 kate spade new york accessories Wedding Belles Ravi Clutch – $60. 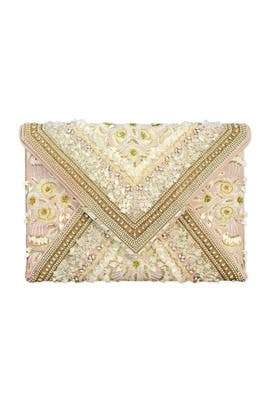 Marchesa Handbags Elisa Envelope Clutch – $400. Disclosure: Some of the links in this post are affiliate links, meaning if you purchase after clicking through a link, Little Vegas Wedding gets a small fee back, at no extra cost to you. Thank you for supporting the site. Spring: that time of the year when the sun hangs a little longer in the sky, the days are warming and the brides and grooms get a little busier. I’m sure your agenda is packed with planning if you are having a summer or fall wedding, but there is a must-attend event going down in Las Vegas on Sunday, March 1 at Bally’s: the Las Vegas Perfect Wedding Guide Wedding Show. From 12:00 pm to 4:00 pm that day, more than 60 of Las Vegas’s most experienced and welcoming wedding professionals will be on hand to meet you and answer your questions. wedding. Multiple Las Vegas wedding venues, florists, DJs and photographers will all be on hand in one event-filled afternoon. Readers of LVW can get in for just $3 if they use the code LittleVeg (tickets are regularly $10 at the door!) Get more information on the vendors and use the code to purchase your tickets at las-vegas.pwgshows.com. Of course, it’s not a bridal show without prizes and freebies. One lucky couple will win a three night/four day stay at any all-inclusive Palace Resort in Mexico, compliments of A Travel Desk. Other prizes include catering and DJ packages, all valued at $500 or more. Every bride or groom attending will also receive $1,000 in PWG Bucks to use on vendors participating in the show. And the first 100 lucky attendees will receive a complimentary event tote bag stuffed with goodies from show vendors! No matter what stage of wedding planning you’re in, the PWG Wedding Show has something for you. 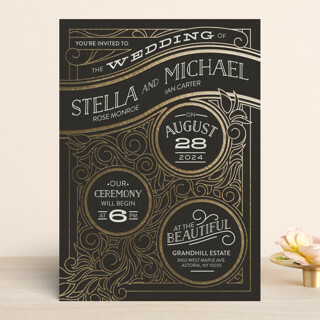 Every pre-registered bride/groom will receive a $200 gift card to SymbolizeIt.com to use toward wedding prints, customizable wooden frames, guest books and signature cake toppers. It’s sure to be an awesome afternoon watching the latest in wedding wear at the fashion show. Bring your bridal party and try cocktails, complimentary appetizer and cake samples; gather inspiration for tablescapes and floral designs; and sample tons of freebies like photo booth pics or hair and makeup looks. Photos in the post by Neon Sun Photography, courtesy Perfect Wedding Guide. This post was sponsored by Perfect Wedding Guide Las Vegas. I don’t think I have to tell you, that getting married in Las Vegas is full of excitement and adventure. However, for those of you looking to take it to the next level, I can only recommend one thing: incorporating a helicopter into your wedding day! If you are seeking an extra thrill and special memory to add to your wedding day, Maverick Helicopters offers the amazing opportunity to get married at outdoor venues like the Valley of Fire and Grand Canyon. These two jaw-dropping locations surround your wedding vows in incredible scenery, vistas with unbelievable colors and other amazing sights for outdoor weddings that only Mother Nature could provide. Whether you are a nature-lover, thrill-seeker or have just always longed to see some incredible world famous destinations, Maverick Helicopters has you covered. The first-class helicopter company excels at providing wedding around — and above — Las Vegas to ensure your marriage starts with an exhilarating adventure and gets your hearts racing. The romance of a private helicopter flight is something you will never forget, even on a day as memorable as your wedding! Fly to the Grand Canyon to get married at one of the most famous natural formations in the world! Your private helicopter pilot will provide a birds-eye view of the Vegas valley as they guide you over the stunning Lake Las Vegas, past the Hoover Dam and Lake Mead, before descending 3,500 feet below the rim of the Grand Canyon. It is here, at an exclusive and private landing spot, where your ceremony will take place. Post-ceremony, celebrate with some sweet bites and bubbles before finishing with a night-time flight with a stunning view of The Strip, leaving the night to you as newlyweds. Most weddings run four to five hours, typically, and range in cost from $1,099 to $4,299. All packages include your ground transportation to and from the airport, your private flight, minister, hors d’oeuvres and Champagne. There are options to add-on special touches like a photographer, floral touches and cake to complete the experience should you wish. Such a marvelous way to start a marriage! This post was sponsored by Maverick Helicopters. 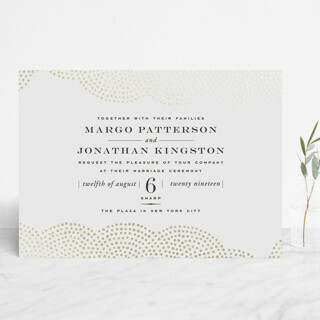 Foil-pressed, shimmery invitations are on trend for 2015 weddings. Conveniently, I think they are incredibly suitable for Vegas weddings, too. The multi-dimensional designs are modern with a touch of glam, alluding to the stylish and high-energy venues available in the city. 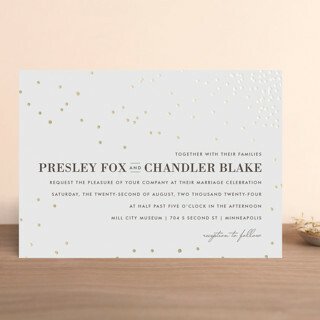 These wedding invitations are also decidedly New Years Eve inspired, which is fitting as this post will end the year for Little Vegas Wedding. You may have noticed I’ve lightened the posting recently as I’ve had a pretty heavy work schedule at my day job, so I’m taking a bit of a holiday hiatus and much needed break. But I’ll be back at it in 2015. 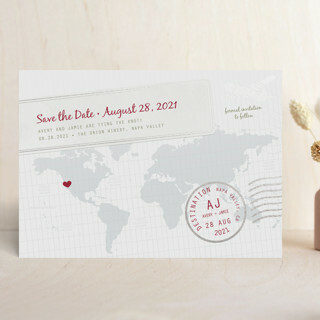 Lots of amazing weddings and a really lovely vow renewal are queued up. Have a great Christmas! Okay, so this isn’t foiled, but it IS sparkly! 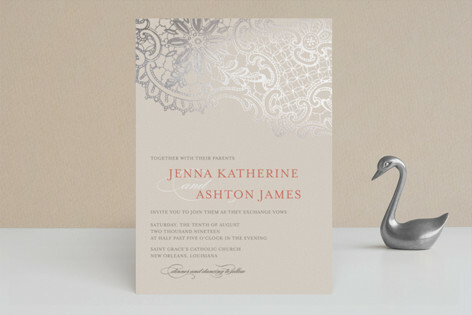 Glitz and Glamor – $1.19 from: Shutterfly, Inc.
See more foil pressed wedding invitations here! Some of these links are affiliate links. By clicking these links and purchasing through them, you are supporting Little Vegas Wedding, at no additional cost to you. Thank you! Photobooths for Your Vegas Wedding + a Giveaway! While hashtagging your wedding for people to post on social media is fun, do you know what’s even more fun? Setting up a real photobooth. With props. And custom logos and backgrounds. And a camera that won’t be at the mercy of low lighting, get blurry or run out of juice part way through the night. 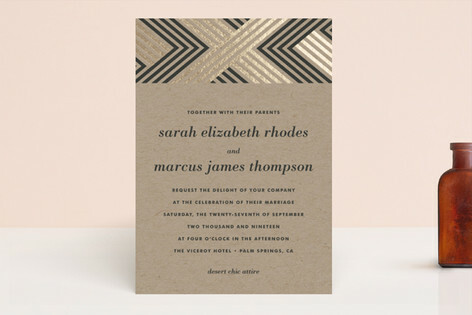 custom print design that will match your wedding theme. Also included? The fun part: props! All this for $575. Add-ons are also available, including social media sharing, duplicate prints, a guestbook, different backdrops, additional time and more. Inquire for exact pricing or head here to see more example images. What else is awesome about them? Well, of course, the high-quality camera and lighting equipment. But these booths also accommodate large groups (no more squeezing everyone in behind the curtain!) include many different backgrounds (including some Vegas landmarks) and on-site printing and help from an on-site attendant. Great when people start to enjoy the cocktails a little later into the night. To top off the awesomeness that are Taylored Photo Memories’ mobile Vegas wedding photobooths, they are also giving away a photobooth package to one lucky couple. Yup! You could win a photobooth for your Vegas wedding. So what’s included with this prize? fun props and awesome photos! This contest is open to international entrants, however any travel fees to Las Vegas and wedding reception costs are the responsibility of the couple and their guests.